Update - March 03, 2013: Brilliant resumé about the history of Stevenage's cycle network and the visionary who planned over at Roads Were Not Built for Cars. I found this in a book at the library a couple of years ago - can't remember the book - about Danish/Dutch style bicycle network in... Stevenage. Anyway, I believe the book was from the 60's or early 70's. From the photo, it looks promising. I haven't been to Stevenage recently so I was wondering if any of our British readers could tell us tales of promise from this hidden bicycle culture pearl. What's it like in Stevenage these days? 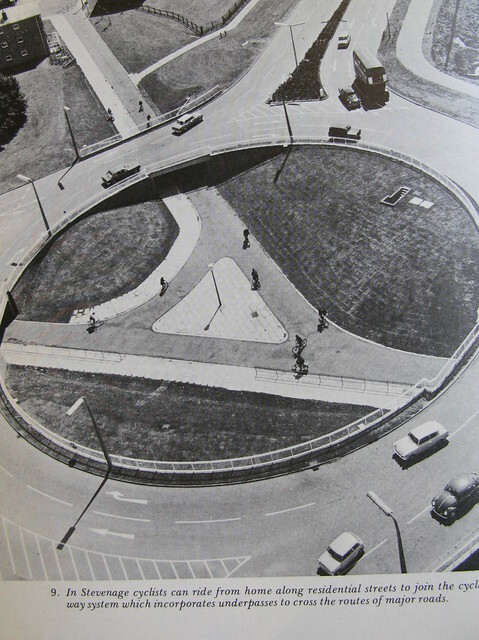 Is this intersection still around?